Malta has been recognised as being the leader in crypto regulation by international bitcoin publication CoinDesk, a leading online news site specialising in DLT and digital currencies. 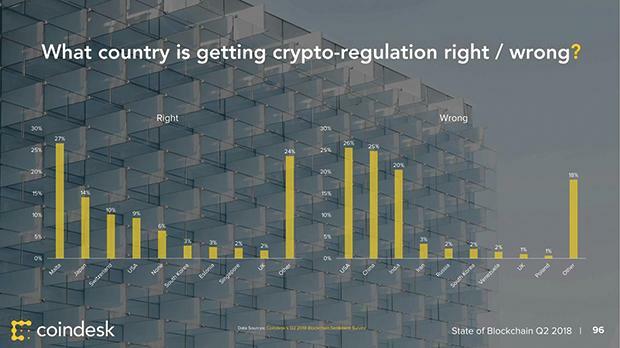 In the most recent quarterly sentiment survey, Malta was overwhelmingly voted as the jurisdiction getting bitcoin regulation right ahead of Japan, Switzerland, the US, South Korea, Singapore and the UK. Parliament has officially passed three Bills into law, establishing the first regulatory framework for blockchain, cryptocurrency and DLT (Distributed Ledger Technology). This makes Malta the first country in the world to provide an official set of regulations for operators in the blockchain, cryptocurrency and DLT space. Taking a technology first approach, the regulatory framework focuses on internal governance and responsibilities of the regulatory authority to certify platforms and provide legal certainty to users wishing to make use of a DLT platform. The second gives certainty to those setting up exchanges and companies operating in the cryptocurrency market and the third establishes the regulatory regime governing products such as ICOs, cryptocurrency exchanges, wallet providers, and others. This three-part system offers legal certainty, that will protect consumers, safeguard investors and will allow for more transparency while not stifling innovation. The CoinDesk survey is already demonstrating that Malta is one of the most desirable locations to set up a crypto business and cementing Malta as a pioneer in economic innovation.